English Rose Suncatcher - A pretty addition for your home or garden. Semi-Precious Stones: Agate, moonstone, rose quartz, white jade, pink jade, garnet, Czech glass beads. Metal: Solid copper wire with a patina finish polished to reveal the warm coppery tones beneath and set with a gloss coating. Width Approx: 11cm / 4.3 inches. Height Approx: 13.5cm / 5.3 inches. Learn to make a hanging heart decoration from metal wire, gemstone & glass beads. The colour palette is called ‘Wild Rose’, inspired by the rambling English rose wild-flower. This starter kit has all the materials you need to make this design. 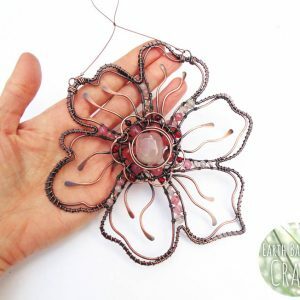 Learn basic wire work techniques that are easy to master, helping you begin your wire journey. A delicate feminine suncatcher design with three heart shaped hanging droplets made with copper, deep red garnet, moonstone, fluorite, agate semi-precious gemstones and dusky pink cherry glass beads. Whether for hanging in your lounge window for some lovely sparkly highlights or out in the garden for year round colour, this metal hanging heart design is rather sweet! Give as a gift to a dear friend, sister, daughter or for mother’s day. Pink, red and girly!